We start off being kind to ourselves, but what happens later? 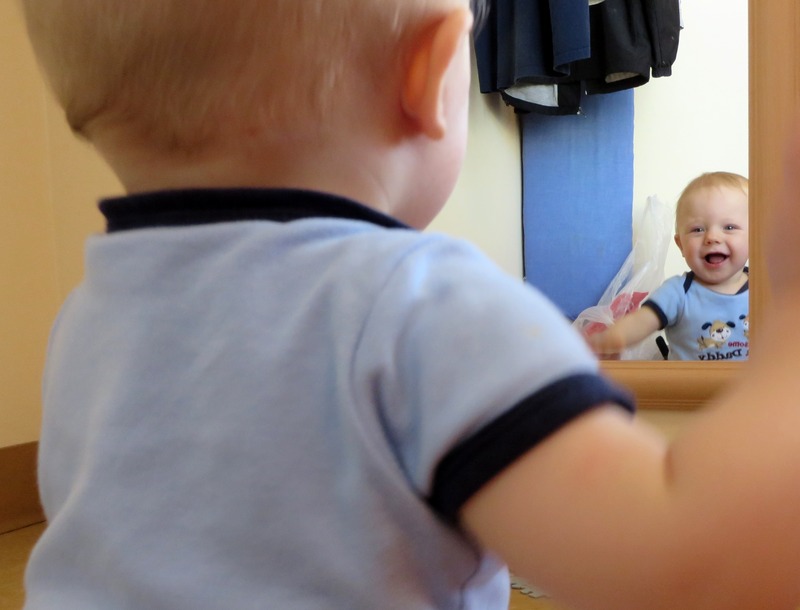 10-month-old Grady likes what he sees in the mirror at the beach cottage. He never cared about me. I never feel like part of any group I’m with. I don’t belong anywhere and never will. I give up. I fail at this every time I try to do better. I could go on and on, and I’ll bet you could too. The ways in which we taunt ourselves might differ slightly, but the underlying messages are identically destructive. Why do we do it? On the other hand, bullies don’t just say overtly cruel things. Sometimes they lie to us by pretending to be friends, tricking us into doing what we wouldn’t normally do, or creating false hopes destined to be dashed. We can bully ourselves in this way, too. Does any of this sound familiar? Everyone else does it; why shouldn’t I? I know it’s bad for me to feel such anger toward someone else but hey, I’m only human. Nobody will ever know about this but me, so it can’t possibly hurt anyone. Mae West was right– too much of a good thing can be wonderful. Oh, who cares? One more doughnut/drink/purchase/cigarette/gambling loss isn’t going to make much difference now. I think there are very few of us who have not been bullied at least once in our lives by a cruel person. Even if they hit us with words instead of fists, it still creates damage. But I agree with McGill that most of us take far more abuse from our own thought patterns than from others. Perhaps mean people were the ones who trained us in the art of putting ourselves down, but that doesn’t mean we have to continue their pattern of spiteful talk. Today, let’s stand guard over the bully in each of us, and not allow anything ugly to win the day. Most of us learned to be pretty good about curbing our inhumane talk to others, although we may need to work on what we say behind their backs. But I think our most difficult struggles will be against the bully inside our own heads, telling us we deserve the self-defeating thoughts we repeat. Celebrate Be Kind to You day today! I think we could all use more kindness, and if we begin inside our own heads, it’s bound to spread beyond us. Yes, Harry, I think so– very often, anyway. Be kind to you day! What a nice thought, I really need that. I’m stressing about packing, moving and storing my stuff. I’m still having anger at my husband and so often coming down hard on myself just as in your examples… I’m a bad mother , daughter and was a bad wife, failure, failure, failure. I never realized I was bullying myself but I’ve recently come to understand that my soon to be ex was bullying me and verbally abusive. Thank you for the thought to quit bullying myself and be nice to me today! Once again, your blog has helped me see things in a new and better way. It’s surprising sometimes how long it takes us to realize that the way someone else treats us isn’t loving or even civil. It can be particularly confusing when that person does show us love in other ways. One reason I appreciate character-driven fiction– the kind that avoids stereotypes– is that it can open our eyes to how complex humans can be; how a person is rarely all good or all bad, and how a basically good person can still ruin the life of another with careless and unintended cruelty. Just as we can be bullied by others without realizing it, we can do the same to ourselves, as you are experiencing. And like so many other types of abuse, we can turn around and do the same to others without intending or seeing it. All the more reason to “take every thought captive” (2 Corinthians 10:5) and not allow our negative thoughts to drown out the truth that we are loved and capable of good and even great things. I honestly think that loving others becomes much easier when we are kind to ourselves, and the reverse is true also; when we are kinder to others, it follows naturally that we will be kinder to ourselves. None of us can escape ourselves. Yet we have the ability to make it so, that we don’t have to. I never heard that quote from Jerry Lewis but it’s a good one to remember! Sometimes living with ourselves is our biggest challenge…but as you say, we can master it. Thanks, Julia. Like the Steely Dan quote. What a great reminder! This makes me think of Ann Lamott who taught me the phrase “Be Kind to Yourself.” We are all so hard on ourselves! If only we were as kind to ourselves as we are to others! I love this photo of G!! What a smile! I love that look of delight on his face in so many of the photos and videos from his first year. Instant mood booster! That’s why I binge-watch Grady videos when I’m feeling down. Yes, we need to be kinder to ourselves. Somewhere along the way, most of us picked up the habit of being mean to ourselves as a sort of false humility or discipline, but when we look at those who are strongest and most exemplary of faith and unselfishness, it’s a curious fact (almost an afterthought, something we don’t see until we look for it) that they almost always seem to enjoy being who they are, without expecting perfection of themselves or anyone else. It’s something to strive for. This is an area I’ve been working on, Julia. Treating my self with the kindness I give to others. It improves one’s outlook considerably. It really does! It’s a win-win situation. Be kind to me day🎉🎉🎊🎊🌻🌻🌻 what a wonderful idea! No negative self talk allowed! Sheila, yes, I think that’s exactly what causes an implosion. Not only do I need to quit planting little dynamite sticks and IED’s inside my head; I need to be on the lookout for those that have already been planted– by me or others– and gradually, gently disarm them. Thanks for your encouragement about the blog. As always, it’s greatly appreciated. I posted your URL on the UR site. There were many positive comments from others who had read this and Cherie asked for your address. You have lots of fans! Ann, thanks so much for sharing the link to the blog. I was able to get over there briefly yesterday. I so appreciate the encouragement. I don’t know how we would have survived those awful days of shock after Jeff’s diagnosis without the prayers and support of the “cyber chapel” at UR. Yahhhhh! It’s a Grady photo. Tee-hee, that’s a Q-ute one too. I wonder what we think as a young babe looking at ourselves? “hey, want to play with me? Look mama, a baby!” Wish we could bottle that joy and innocence and save it for when we’re grown-up. K, YES, I wish we could bottle “Essence of Grady” to use as cologne and room deodorizer, as well as mood lifter! I am sorry you were mistreated by your h.s. boyfriend. When I hear such stories, it reminds me that there are worse things than having NO boyfriend (which was always my particular problem). I think so many young girls feel pressured to be in a relationship. And yes, I totally agree that having a negative, controlling parent sets us up for seeing that type behavior as normal and even as a sign of love. Long story there, better leave that one before “I digress” majorly here…I’m glad you have been able to break away from those destructive patterns and see how they harm us. You should NEVER bully yourself! From the first day I met you OVER 25 YEARS AGO! 😀 you have been one of the most loving, generous and fun people I have ever known. I have always been blown away by your generosity to anyone who crossed your path. Not to mention you are a total riot to be with. So I will beat up the bully inside your head anytime. And you know what a tiger Mama I can be! Let’s have some chocolate and plan our next mischief intellectual discussion over tea. Love you too! Jerry Lewis: ahead if his time, sage advice. I agree! I’m glad Alan shared that quote.